Please email the following items to Michelle Everson at meverson@gmu.edu in one single PDF file containing all application materials. *Program cost: This cost includes: 6 credits, housing at local university, cultural activities and visiting speakers and instructors, transportation to program activities, and some communal meals. Flight is not included. Accomodations for partners/children available for a small additional fee. Price subject to change if fewer than 10 students travel to Indonesia. Dr. Leslie Dwyer will lead this program. 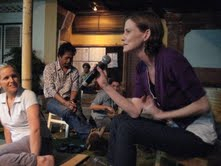 Dr. Dwyer is an anthropologist with 20 years of experience working in Indonesia. Her most recent projects have focused on the long-term cultural and political effects of the mass violence of 1965-66 in Bali, debates over transitional justice in Indonesia, and the globalization of discourses of trauma and psychosocial repair. She has special interests in gender and conflict, ritual practice, power and inequality, and the ethics and politics of field research in conflict and post-conflict settings.